TunerFreeMCE has the ability to run content from a variety of different sources, but doesn’t cover every site out there. Fortunately TunerFreeMCE allows developers to write simple plugins to bring other content in too. To install the plugins, go to the preferences and then pick the plugins tab. If you are interested in writing your own plugins, see here for instructions. Each plugin will be delivered in it’s own directory, so create an appropriately named directory. In that directory you can place all of the files required for your plugin. provider. This is a code used to identify the provider of the content. It should only contain a-Z, 0-9 and _.
country, This should be an ISO country code. Used for VPD switching. programType. Can be PLAYER, FLASH, WMV or WM. See section 7 for details. parserProgram. Optional. This is the name of a library that you can produce to do the parsing if you need to override the standard behaviour. See section 9 for details. code. This is the internal code used to identify the channel. It should start with the provider name, and only contain a-Z, 0-9 and _.
smallLogo. Optional. This is a url to the logo of the TV channel that will be displayed next to the program name. This can be an http://, file:// or resx:// url, or can be a filename in the plugin directory. This will be displayed at a size 20×20. If this is not specified, the logo url will be used. background. Optional. This is a url to the background that will be shown when browsing this channel. This can be an http://, file:// or resx:// url, or can be a filename in the plugin directory. If this is not specified, the default TunerFree logo will be used. feed. This is the url which the system should go to to get a list of programs for the channel. namespace. Optional. If your xml requires namespaces to parse, specify each namespace in a tag with an attribute of name to specify the namespace, e.g. <namespace name=”video”>http://www.google.com/schemas/sitemap-video/1.1</namespace>. You can have as many namespace tags as required. channelPrefixTag. If your feed contains multiple channels in one XML file, you can specify which tag contains a channel name and prefix this to the code from the channel definition to create multiple channels from one stream. You can add dummy channels with empty feed strings to the channel list to specify channel icons for each prefixed channel. If the value you need to get from the xml is the tag value (e.g. <id>123</id>, simply specify the tag name in the definition (e.g. <programIdTag>id</programIdTag>). If the value you need is in an attribute of the tag (e.g. <id val=”123″/>), specify the attribute name in the “attr” attribute of the definition (e.g. <programIdTag attr=”val”>id</programIdTag>). If there are multiple nodes with the same name in the feed, you will need to pick one of them e.g. To read the date format, also specify a date mask in C# .NET format, e.g. <dateFormat>ddd, dd MMM yyyy HH:mm:ss</dateFormat>. Your date string may contain information that you don’t want to parse at the end, e.g a timezone. To ignore that, simply don’t specify the whole date format string – the date will be truncated to the length of the format string before parsing. WMV and WMA content can be displayed directly within media center, so no further options are required for this. Here’s another complete example, this time for the 4OD plugin. Key points to note are the player size is 640×363. It needs to go full screen because it cannot scale the video in the window, to the FSX and FSY are specified. The player is still moved to the top left so that the clicks can occur, but the player is not zoomed (because that won’t work on this page). "C:\Program Files (x86)\MillieSoft\TunerFreeMCE\TunerFreeMCEWebBrowser.exe " "http://www.bbc.co.uk/iplayer/tv/bbc_one_london/watchlive" "C:\Users\Bob\myplugin\player_config.xml" "Windows Media Center"
Option 2 will display the video in a from in a web page within media center. The software will click on the appropriate points on the page to make the video play and go full screen. You need to tell the software where to click by giving the X and Y coordinates of a number of possible click points. You can include basic calculations using +, – and * and the constants H (screen height), H2 (half screen height), W (screen width) and W2 (half screen width). So, if the play button is 300 pixels to the left of the middle of the screen, specify it as “W2-300”. If a click is not applicable, specify the coordinates as 0,0. StartPlay. This is the location to be clicked to start playback first time. To calculate the click positions, I put media center in to full screen, navigate to a page and then take a screenshot. I then paste that in to Paint and use that to find the co-ordinates of points on the screen. When not in full screen, the Y positions tend to be a fixed number, and the X positions tend to be plus or minus a fixed amount from the middle of the screen. In full screen, the Y position tends to be a fraction of the screen height, and the X positions again tend to be plus or minus a fixed amount from the middle of the screen, but are sometimes a fraction of the screen width. Sometimes feeds need authentication, e.g. they need you to have logged in in your browser first. The cache builder can pick up a logged in session from your browser, but only if you add the site to your Trusted Sites in IE by going to the Security tab in Internet Options, clicking on Trusted Sites and then Sites, and adding the site to the list. To allow authenticated access at the time of playing the video, be sure to add the site to the Sites list in the Privacy tab of the Internet Options. If for some reason you absolutely cannot get the contents of the feed using the standard parser, you can write your own code to populate the program list. However, for most use cases this is unnecessary, and this step is optional. To do this, you need to write a windows library. You can name the library whatever you like, but the namespace should be the same as the dll name, and the parser class should be the same as the namespace. For example, the Dave parser is in DaveParser.dll, which has a namespace of DaveParser, and a single class called DaveParser. this class is run when parsing. It takes an input of the current list of programs, and the current directory, and you need to return the new list of programs. You need to add or replace to the list. You must not create a new list, or previous programs will be lost. This is to allow you to add only missing programs if you need to. You can set values of added, removed and total for the number of items processed. This will be displayed in the parser window. this class is run when playing. It takes an input of a TVProgram, and should return the TVProgram with the details populated. You could set both the URL and the player type in this method if required. To test your plugin, put it in the C:/ProgramData/MillieSoft/TunerFreeMCE/additional_plugins folder. This folder is used to pick up any plugins that are not installed directly via the plugins page in TunerFreeMCE. After you have created your plugin, run TunerFreeMCECacheBuilder.exe to pick up your programs. If you run the code with a -debug flag, some additional information will be outputted that may help you if you are having problems. After you have created your plugin, email me at martin@milliesoft.co.uk to get your plugin added to the list of plugins shown within TunerFreeMCE. If your plugin includes a dll parser, please also include the source code for review. We need to do that to avoid malicious code. The way that TunerFreeMCE plays, pauses and goes full screen for flash based content is it simulates a mouse click in just the right place. The software has some pre-seeded click positions for the most common window sizes, and does it's best to calculate the rest. This is done by looking at the file C:/ProgramData/MillieSoft/TunerFreeMCE/resolutions2.dat. That file is automatically updated on the fly too every time the list of programs is built, so any changes to the click positions, e.g. due to new banner adds on the pages, can be pushed out automatically. Sometimes though, for whatever reason, your media center just doesn't quite display things in the same position as everyone else. You can set your own positions for the clicks by copying resolutions2.dat to C:/ProgramData/MillieSoft/TunerFreeMCE/resolutionOverride.dat. If that file exists, it will be read first, and does not get overwritten by the system. where “bbcPlayNonFSX” means the X coordinate of the bbc play button not in full screen and so on. Don't forget, when new functionality is added (e.g. the BBC HD streams recently), you may need to get a new copy of the resolution file to work from, because new click coordinates will be added. Instructions here refer to AlwaysVPN as an example, but that should not be seen as an endorsement. It worked for me OK though. 2) Buy a proxy server package, e.g. AlwaysVPN. Download and install the config file from them (just the config file – you already have the OpenVPN client downloaded in step 1). 3) Go to C:\Program Files (x86)\OpenVPN\config and create a text file with your username for the VPN service on the first line, and your password on the second. Save it as “user_auth.txt“, e.g. 7) Right click on Media Center, and select Run as administrator.This is important, because the openVPN command needs to run as administrator to configure the network settings. 8) When you browse to hulu, it will open your US VPN connection. When you go to UK programs, it will kill the VPN connecton so that you can watch UK programs though your regular UK broadband connection. 1) Set up your windows VPN connection as described by your VPN provider. This will create a network connection in the Network and Sharing center. In this example, we will say the connection is called “MYUSVPN”. Here's a list of different services that have been tested by TunerFreeMCE users. This is not an endorsement of the sites that work, but is just provided to help people. Follow the same instructions as for UK users, but set your default country to US, and create an openUKVPN.bat file that opens the UK VPN, and a closeUKVPN.bat file that closes the VPN. 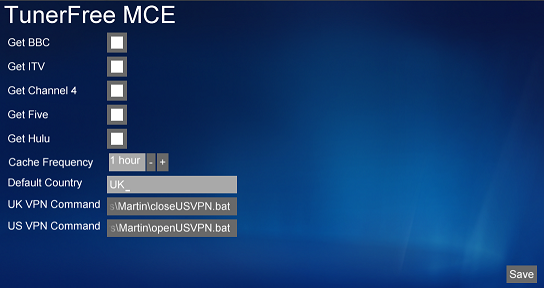 Put the openUKVPN.bat file in the UK VPN Command prefernce, and the closeUKVPN.bat file in the US VPN Command prefernce. If you not in either the UK or the US, you will need to open a VPN connection for both countries. To do this, set the default country to your home country (e.g. CA for Canada), and create two command files, openUKVPN.bat and openUSVPN.bat. In the openUKVPN file, put a command to close the US connection and then open the UK one. In the openUSVPN file, put a command to close the UK connection and then open the US one. This will swap between the two connections fine. When you exit media center, just kill any remaining VPN connections. 4) Edit the preferences as described above. As before, if you are connecting from a different country, simply change the commands to suit. Some VPN connections require you to run as an administrator, which is a pain on Vista in particular. There is a great solution to this documented here. In summary, you create a task in the Task Scheduler to run your VPN command, and select the Run With Highest Privileges option. Don't set any triggers so that it doesn't run on it's own. Then create a bat file which runs the task, e.g. it should have C:\Windows\System32\schtasks.exe /run /tn “Start VPN” where Start VPN is the name of your task. Then add that bat file as your VPN command. if specified, the background service will write output to this file. Make sure it exists and is writable. If specified, this the latest version that you have chosen to ignore in the version checker. If specified, this is the date on which the version checker will next check. This is the default country code for VPN switching, e.g. if set to UK, it will not need to do a switch when you go to UK programs, but will if you go to US.